First, let me say that the Bank of Canada should get full marks for correctly anticipating the need to cut the policy rate to 0.75% in January and again to 0.50% in July. Many economists criticized the BoC for acting too soon and/or for surprising markets. But now, with the benefit of hindsight, it is clear that Governor Poloz and his colleagues provided timely and appropriate monetary easing. While I have advocated rate cuts since early January and believe that additional easing may be needed, I think that the BoC should pause for now. I'll state my case by first reviewing the case for an additional rate cut now, then reviewing the case for standing pat, and finally by outlining some additional strategic considerations. Economic data available through September 1 provide support for another rate cut. Real GDP contracted modestly for a second consecutive quarter in 2Q15. This has touched off a lively debate in the financial pages over whether this meets the definition of a recession. Some say that, at least, Canada is in a "technical recession", which they define as two consecutive negative quarters of real GDP growth. But this is an arbitrary definition latched onto by the press because it is simple to understand. More sophisticated analysts use the National Bureau of Economic Research definition, which says that for a recession to be confirmed in the judgement of a panel of qualified business cycle economists, there must be "a significant decline in economic activity spread across the economy, lasting more than a few months, normally visible in real GDP, real income, employment, industrial production, and wholesale-retail sales". So far, industrial production and real incomes have fallen while employment and sales have held up. It normally takes a year or more for a recession to be confirmed and it is far too soon to render such a judgement for Canada. 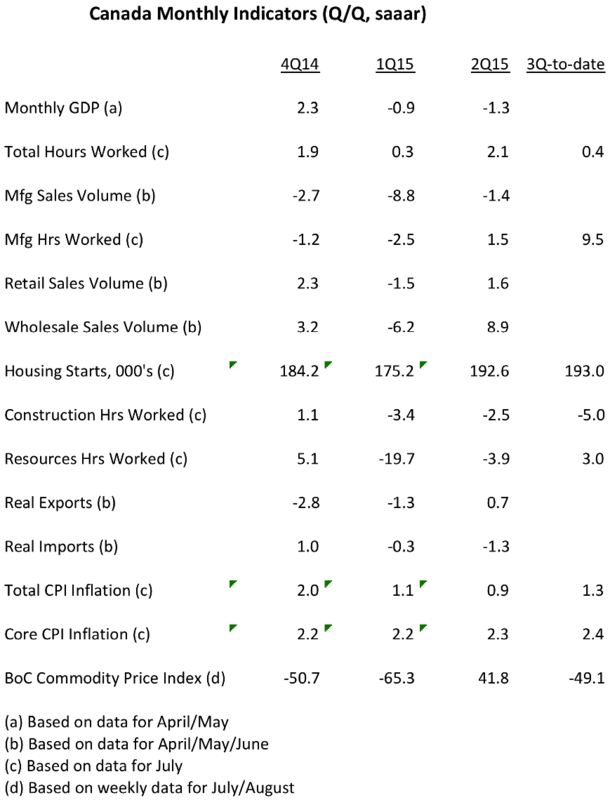 More important than whether the economy is in recession is the fact that, by the Bank of Canada's latest estimate, the output gap worsened to -2.2% at the end of 2Q15 from -1.1% at the end of 4Q14. The economy was twice as far away from the BoC's definition of full capacity at mid-year than it was when the year began. This is the most compelling rationale for the easing that has already occurred and possibly for the need for additional monetary ease. Inflation, measured by the annual change in the CPI, averaged just 0.9% in 2Q15, before edging up to 1.3% in July. That is well below the Bank of Canada's 2% inflation target. Inflation expectations remain muted based on survey data and falling breakeven yields on real return bonds. Commodity prices, after firming in 2Q15, have resumed the plunge that began a year ago in 3Q. As readers of this blog know, in my opinion this is one of the most important leading indicators for the Canadian economy. Canada is a small open economy. Commodity-based products make up a large proportion of Canada's exports, while finished consumer goods and business machinery and equipment make up a large proportion of Canada's imports. When commodity prices fall relative to prices of finished consumer goods and machinery and equipment, Canada suffers a reduction in its terms of trade. This has a direct negative impact on real national income. 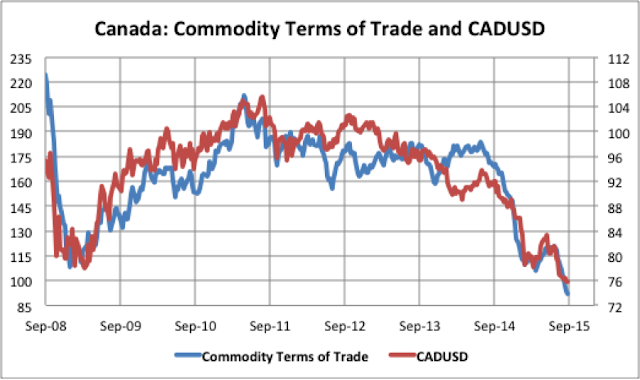 The chart below shows that the Commodity Terms of Trade (CToT), which I define as the Bank of Canada's Commodity Price Index divided by the Core CPI, has renewed its' sharp decline and has fallen to a level below that seen at the depth of the 2008-09 Great Financial Crisis (GFC). The Canadian dollar has appropriately weakened along with the CToT to cushion the blow on the commodity producing industries. The weaker currency also spreads the effect of the CToT decline across the economy by reducing the real purchasing power of Canadian dollar incomes of consumers and businesses. This should also, over time, encourage a redeployment of resources out of the commodity-based sectors into now more internationally competitive manufacturing and tradable services. But this will take time. For these reasons -- a widening output gap, low inflation and a further sharp decline in the Commodity ToT -- another rate cut by the Bank of Canada is easily defensible. Although real GDP growth was negative in 2Q15, there were some bright spots in the economy. Total hours worked (the best measure of employment) grew at a 2.1% annual rate in 2Q after just 0.3% in 1Q. Retail and wholesale sales volumes rebounded to moderate growth after contracting in 1Q. Housing starts picked up after dropping sharply in 1Q. Real export volume edged up after dropping in the two previous quarters. Data through July show that 3Q was on track for a further gain in total hours worked, some improvement in manufacturing activity, and solid housing starts. The Bank of Canada's measure of core inflation has moved up to 2.4% in July, from 2.3% in 2Q, and 2.2% in 1Q. This worries some economists. Core inflation is supposed to be a better guide to future inflation than the current total CPI inflation rate. But this is often not true for Canada, especially during sharp moves in commodity prices. When commodity prices fall sharply and the Canadian dollar weakens, prices of imported consumer goods rise in Canadian dollar terms even if they are stable in the currency of the exporting country. So as commodity prices have fallen, prices of many imported products in the Core CPI have been pushed up. This is the anomaly for Canada: when oil and other commodity prices fall, core CPI inflation is temporarily pushed up by the appropriately weakening Canadian dollar. When oil prices and the Canadian dollar stabilize, core inflation will come down. So the current 2.4% core CPI inflation rate is not a good guide to where inflation will be in the future. On the contrary, it is giving a misleading signal. Nevertheless, some economists have used the elevated level of the core CPI to argue against further easing of monetary policy. 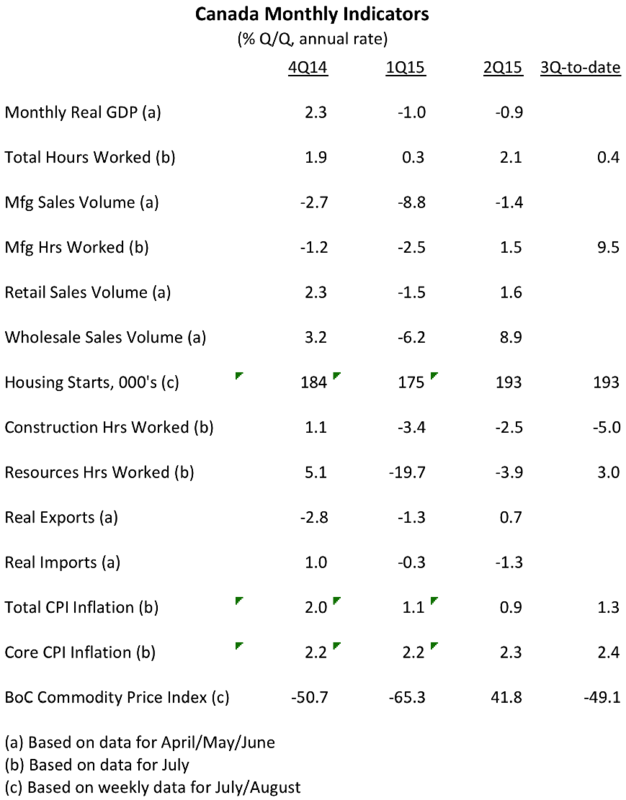 For these reasons -- signs of some improvement in the economy in early 3Q data and an above-target core CPI inflation rate -- it is possible for some economists to recommend that the BoC should hold the policy rate at 0.50% in September. First, the economic impact of the financial market volatility seen in August -- especially the sharp drop in commodity markets and global equity markets led by China -- will not become clear until more data becomes available for 3Q15. One assumes that such volatility will tend to dampen global growth, particularly in commodity exporting economies and those with strong trade ties to China. However, the impact on advanced economies, including the US, Eurozone and Japan is not so clear, as these economies tend to benefit from lower commodity prices. Second, Canada is in the midst of a federal election campaign with the vote scheduled for October 19. The incumbent Conservative party is in a three-way fight with the left-leaning New Democratic Party (NDP) and the Liberal Party. The three parties have quite different ideas about fiscal policy. The Conservatives favour pursuing a balanced budget, although they have in the past permitted the deficit to rise during periods of recession. The Liberals favour increased infrastructure spending and allowing budget deficits of "up to $10 billion" per year for at least two years to support the economy. The NDP favour increased spending on a national child-care program and greater support for municipalities funded by increased corporate and gasoline taxes. The NDP has had an early lead in opinion polls, although this may be shrinking. Nevertheless, the election outcome is highly uncertain and the eventual policy changes, if any, are unpredictable. Some observers, including myself, believe that a minority government led by the NDP or in some coalition with the Liberal Party, could have a substantial negative impact on business confidence and investment spending, not unlike what happened when the NDP formed governments in Ontario (1990-95) and British Columbia (1991-2001). This has the potential to further weaken the Canadian dollar and to prolong and deepen the current economic downturn. Third, the Bank of Canada needs a game plan to deal with the possibility of a further weakening of the Canadian economy. Just one more 25 basis point policy rate cut will return the policy rate to its GFC low of 0.25%. This will not be enough easing to deal with a further weakening of the economy. The Bank needs to consider a wide range of options, including: moving to a zero or even negative policy rate; policy rate guidance that commits to holding the policy rate at an exceptionally low level for an extended period of time; and various forms of quantitative easing. 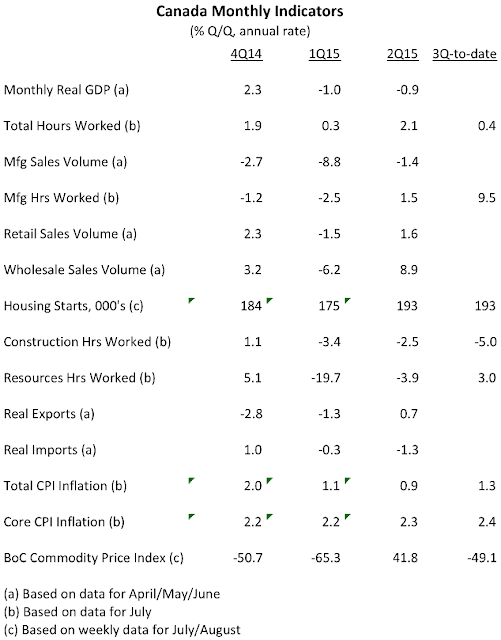 The Bank of Canada has performed its role of stabilizing inflation and economic activity admirably so far in 2015. In doing so, it has used a couple of its' few remaining bullets. At this stage, despite a strong case for additional easing, I believe that the Bank should hold its fire until after the federal election. By this time, it will be possible to judge the impact of the renewed plunge in commodity prices, the impact of recent financial volatility on global growth, and the likely future stance of fiscal policy. Make no mistake about it. This is a challenging moment for the Canadian economy. What is not needed, is for the Bank of Canada to inject itself into the midst of the election campaign with a policy rate move that will inevitably become a political football. Ted: Well spotted on the bank's actions to date. Greg: The BoC's actions to date have largely eliminated what I call the "Carney premium" relative to the US policy rate, which provided unjustified support to Canadian dollar. "A further 25bp rate cut" will benefit the overall economy just as much as each of the previous two cuts. It will provide a small cushion to the blow on the energy producing sector and provide a slight further stimulus to the non-energy sectors. What I am more concerned about is a major slowdown in global growth that requires a bigger response. At present, it is very unclear how the BoC would/could/should respond if this scenario played out. I agree with your analysis. Any semblance of Bank indpependence will be lost if they do anything in the next few months. Keep u the good work! Mike: Very nice to hear from you. I remember the days, back in 1980-81, when I was a young economist at Shell Canada and we employed your firm, Informetrica, to run oil price scenarios to gauge the economic impact. At the time, the price of WTI had spiked to the unheard of level of US$40/bbl amid the Iran/Iraq war. Shell asked Informetrica to run a $100/bbl scenario. We were able to show anyone who would listen that higher oil prices would benefit the Canadian economy over the long term. As for the BoC's independence, it is always under threat and therefore not always fully utilized.